13.50 price auto applied at checkout - 3 colours to choose from, pretty good stock levels! Click & collect for free. Stay dry in the colder months with the Ridge Water Resistant Cycling Jacket. 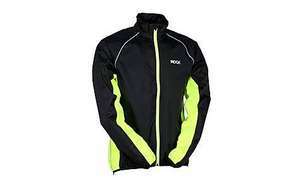 Made from waterproof fabric, this cycling jacket is great for both men and women and features a mesh lining to keep you cool, as well as a reflective logo and trim for greater visibility on those long, dark nights. Tried this on earlier. Okayish. Quite tight fitting, no pockets, not really warm enough for Winter cycling. Decent price if you don't have anything else to wear in the rain. I used to wear one of these they are good for when it's not that cold so it helps with not overheating from cycling but when it is cold you feel freezing I stopped wearing mine my arms would go numb and the other problem is it's tight fit which is what you want when you run or cycle so it's not simple to just put on something thick under it. Order a size or two bigger than you normally do for these. I'm an XL and the XXL was too tight. Damn I reserved the XL and no XXL in my area. Will buy for the old Man I guess.